Led by people living in recovery, those still facing addiction and family members of the deceased, the recovery activist movement is becoming increasingly organized and pressuring for change. Almost a decade after beginning his recovery from heroin addiction, Brett Bramble is undertaking a new challenge. Accompanied by his dog Domino and a small group of fellow activists, Bramble set off on foot in mid-January on a six-month-long, 2,400-mile journey from Florida to Maine. 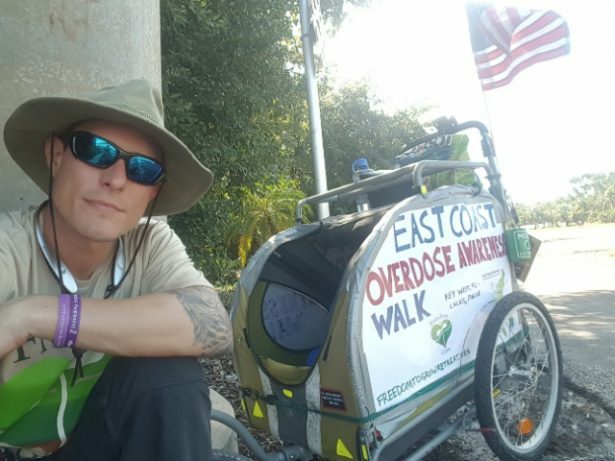 His walk seeks to raise visibility, foster conversations and find solutions to the skyrocketing rates of opioid addiction and overdose that have become a nationwide public health emergency in recent years, killing over 140 Americans a day. 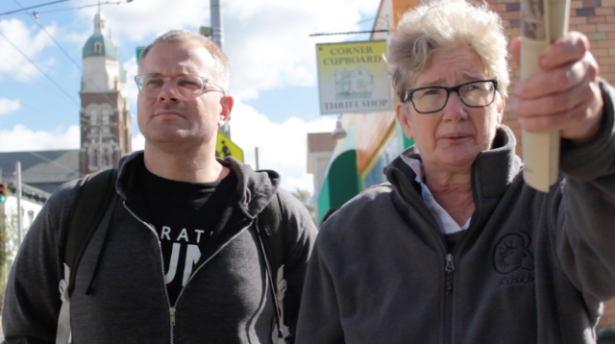 Bramble’s walk is one piece within a broader “recovery activist” movement that has been gaining momentum around the nation over the past decade. Led by people living in recovery or still facing addiction — along with family members whose loved ones died from overdose — the movement is becoming increasingly organized by targeting a variety of actors, drawing in key stakeholders and incorporating a range of tactics to pressure for change. Activists are becoming more strategic in their actions — staging rallies and die-ins across the country, drafting petitions and launching lawsuits. One such activist is Nan Goldin, a 64-year-old photographer in recovery from addiction to OxyContin. In January, Goldin and her group, Prescription Addiction Intervention Now, or PAIN, launched a petition targeting Purdue Pharma and its owners, the multi-billion dollar Sackler family. With nearly 25,000 signatures gathered so far, they are demanding that Purdue fund recovery services, opioid addiction education and public dispensers of Narcan, the emergency medicine dispensed to counter a drug overdose. Goldin’s petition and Bramble’s walk are evidence that the recovery movement is shifting from raising awareness of addiction to pressuring for immediate, tangible action that saves lives. According to Dean LeMire, a New Hampshire-based activist in recovery, “The movement exists in waves.” The first wave involves standing up, identifying oneself as someone living in recovery, and thereby showing people that recovery is possible. The second wave, he explained, is telling elected officials: “We need dollars for this stuff.” That means educating the general public about recovery services and building the political will to allocate adequate funding to prevention and recovery. This “second wave” shift is creating an increasingly mobilized, politically-active base of recovery advocates and activists. Their work has included educating and registering voters — particularly people who are facing addiction or are in recovery — as well as pressuring for legislative change, funding for recovery services and corporate accountability. While such efforts have led to the creation of initiatives like the 2016 Comprehensive Addiction and Recovery Act, or CARA — which funds prevention, treatment and recovery initiatives nationally — much more is needed to address the scale of the growing epidemic. Hampton said his life changed when he watched the 2013 film “The Anonymous People,” a documentary featuring the stories of people living in long-term recovery from drugs and alcohol. Having confronted his own addiction to heroin, Hampton started the Voices Project in 2017, which encourages people to “come out” and share their recovery stories, using social media as a platform for people to connect with and support one another. So far, some of the movement’s major actions have promoted visibility and solidarity among people in recovery, often through coalitions with other campaigns. Since 2014, Families of Addicts has brought together thousands of people for the annual “Rally 4 Recovery” in Dayton, Ohio, which includes a 5k run, a raffle and a balloon launch, as well as resource tables for people facing addiction. On the national level, activists came together in October 2015 with a coalition of over 450 organizations from around the country for the UNITE to Face Addiction rally and concert on the National Mall in Washington, D.C. The rally was hosted by Facing Addiction, a national organization that advocates for the over 85 million Americans affected by addiction around the country. These actions played an important role in humanizing the issue and gaining a spotlight to tell the personal stories behind recovery and addiction. “We saw that storytelling — kicking down those closet doors — could have a massive impact,” Hampton said. Meanwhile, other actions have fallen more squarely under the “second wave” category of mobilizing political pressure. In 2015, activists with the Weed for Warriors project dumped pill bottles and syringes in front of the White House lawn to drawn attention to the overprescription of opioid drugs to wounded veterans. Then, last May, protesters held a “die-in” at the New Hampshire State House when U.S. Health and Human Services Secretary Tom Price visited the capitol. While these incidents make headlines and gain public attention, much of the movement-building work is comparatively slow and incremental, enacted more at the local and state levels. This includes seeking government support and funding for harm reduction strategies, including the formation of recovery community organizations, or RCOs, which are nonprofit organizations that plan recovery advocacy efforts, as well as community education and outreach. Activists are also pushing for syringe exchange programs, increased health care access for drug users, and safe injection sites like the ones San Francisco plans to open in July — the first in the nation. President Trump has repeatedly declared the opioid epidemic a major problem, but does not allocate funding for it to be systematically addressed. In October 2017, the Trump administration declared the opioid epidemic a public health emergency, but did not request emergency funding from Congress and did not declare a national state of emergency, which would have allowed states to use the federal Disaster Relief Fund to address the crisis. Recovery activists described how the escalating crisis of addiction and overdose — as well as the government’s inaction to address it — is increasing the movement’s sense of urgency to take more extreme measures. People have long sought to earn a seat at the table with important decision makers, both Hampton and LeMire explained, but now they may be compelled to take more direct or confrontational measures. While the stigma against people facing addiction serves as a major challenge to the development of an activist movement, one important set of allies is trying to change that: parents who have lost their children to overdose. The testimonies of these parents appeals to public sympathy and outrage, making the movement more relatable to the average person and increasing public pressure for political change. These parents and family members are playing a vital and visible role in the movement, countering some of the negative associations that can be tied to recovery activism with the power of their personal stories, which help to humanize the abstract, demonized image of an addict. “In my personal experience, some of the hardest challengers of the movement have been from within the recovery community itself, mostly the 12-step group,” Hampton said. While these programs have helped a lot of people on their journey to recovery, including Hampton, they represent a different approach to overcoming addiction that is shifting with the new wave of activism and advocacy today. Two months later, Hampton had lost four more friends. An important consideration for the movement to achieve long-term, systemic change is its ability to be representative of all people facing addiction. This means, according to activists at the forefront, that the movement must also recognize its own implicit biases, particularly the predominance of white, middle- and upper-class people it engages. Although the movement is gaining ground today for criticizing the pharmaceutical industry and government policies around addiction, the criminalization of drug users began long before Nixon’s “War on Drugs,” with the persecution of black and Latino communities, and the targeting of jazz musicians like Louis Armstrong and Billie Holiday by Commissioner Harry J. Anslinger, who headed the Federal Bureau of Narcotics from 1930-1962. This history is one reason why LeMire is pushing the current recovery movement to recognize and incorporate the dangers faced specifically by communities of color. “The rallies and protests — they’re a sea of white,” LeMire said. “[People of color] are almost totally missing from the movement, but they have the most to lose.” This shapes one of the movement’s ongoing challenges, addressing the addiction crisis while elevating the voices of marginalized communities. For some, the recovery activist movement aims to help people “find ways to not die today,” as LeMire put it. Yet, on a broader, systemic level, the recovery activist movement holds the potential to activate a massive, invigorated voter base on both sides of the political divide. It gives voice to those who feel powerless or unheard, and shapes the movement as one in which the fight against addiction and injustice will be led by those who have experienced it firsthand. Your representation of addiction is archaic. Stigma is a buzzword. It is misrepresentative. It feeds public support for government policies like ‘zero tolerance’ and ‘intervention’ which are not social support policies are not intended to serve health concerns but are aggressive policies which in turn supports an attack on civil liberties that can not be undone, rewound, repaired. Addiction is as scientifically grounded as hysteria. Addiction is embedded in psychological and environmental variables, it is not comparable to a cold or a stroke or medical conditions that can be examined and understood through hard science. The rising up of the idea of stigma, is that shame? Would seem to serve the purpose of encouraging people called addicts and all interested parties (who would they be? I wonder) to embrace their spurious diagnosis and support an already parasitical and corrupt system that left the Hippocratic oath on some garbage heap to protect another mythical science, economics.